Ken McCarthy was one of the original pioneers of the movement to commercialize the Internet. He sponsored the first conference on the subject of the Web’s commercial potential in 1994 with the then 23 year old co-founder of Netscape Marc Andreessen as the featured speaker. That same year Ken wrote the first article on e-mail advertising that was published in a legitimate marketing industry trade journal. Rick Boyce, who is widely credited with popularizing the banner ad, credits Ken with introducing him to the idea that the Internet could be used as an advertising medium. Ken’s book “The Internet Business Manual” was the first book on Internet entrepreneurship published in Japan and for many years he served as a consultant to NEC, the Japanese equivalent to IBM, advising them on Internet matters. Since 1993, Ken has developed numerous cutting edge training programs that have not only helped his clients make more money, but have also served to advance the state-of-the-art in Internet marketing practice. 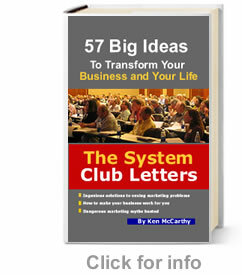 Since its introduction in 2002, Ken’s System Seminar has been widely regarded as one of the most practical Internet marketing trainings in the world. In 2008, the United States Patent and Trademark Office granted him the exclusive right to use the phrase “The System” to describe Internet marketing education products. Before entering the Internet field, Ken produced concerts and radio programs; taught advanced learning strategies at MIT and Columbia University; worked on Wall Street; founded a direct marketing consulting company; and helped start an audio post production studio in New York City that was involved in the making of an Academy Award winning film and one of the highest grossing foreign language films of all time. Currently, he is a special adviser to levees.org and Friends of Hudson, a board member and adviser to Meals for Health and the proprietor of JazzontheTube, the second most visited jazz web site on the Internet. Ken’s work both on and off the Internet has been acknowledged in a number of books including The Complete Guide to Internet Publicity by Steve O’Keefe, Peak Learning by Ron Gross, and How to Make Millions with Your Ideas by Dan Kennedy.